The star of this week's Rule 5 post is Emmy Rossum, who got passed over last week for current events. Emmanuelle Grey Rossum was born on September 12, 1986, in New York City. She is the only child of Cheryl Rossum, a single mother who worked as a corporate photographer. Her parents separated while her mother was pregnant; as of 2007, she had met her father twice. Rossum's mother is Jewish (of Russian Jewish descent) and her father is Protestant (of English and Dutch ancestry). Rossum identifies as Jewish, and has stated that her mother instilled in her the "Jewish code of ethics and morals". She was named for her great-grandfather, whose first name was Emanuel, using the feminine spelling. She is a relative, by marriage, of designer Vera Wang(Wang was married to Rossum's cousin). Upon singing "Happy Birthday" in all 12 keys, Rossum was welcomed to join the Metropolitan Opera Children's Chorus by chorus director Elena Doria at seven. Over the course of five years, she sang onstage with the chorus and had the chance to perform with great singers such as Plácido Domingo and Luciano Pavarotti. For anywhere from $5 to 10 a night, Rossum sang in six languages in 20 operas, including La bohème, Turandot, a Carnegie Hall presentation of La damnation de Faust, and A Midsummer Night's Dream. She also worked under the direction of Franco Zeffirelli in Carmen. An increasing interest in pursuing acting led to taking classes with Flo Salant Greenberg of The New Actors Workshop in New York City. She also has worked with acting coach Terry Knickerbocker. In December 2009, Rossum joined the cast of the Showtime dramedy series Shameless, based on the British series of the same title. The series co-stars William H. Macy. Rossum plays the oldest sister of a large, motherless family, functioning as a guardian/surrogate mother to her five younger siblings. The series has received consistent acclaim, with Rossum's performance being universally praised.She made her directorial debut with episode four of season seven, "I Am a Storm." In December 2016, Rossum was in a contract dispute with the show's producers over her desire for a salary equal to that of co-star Macy and back pay for the differential over seven seasons, which was resolved later that month. 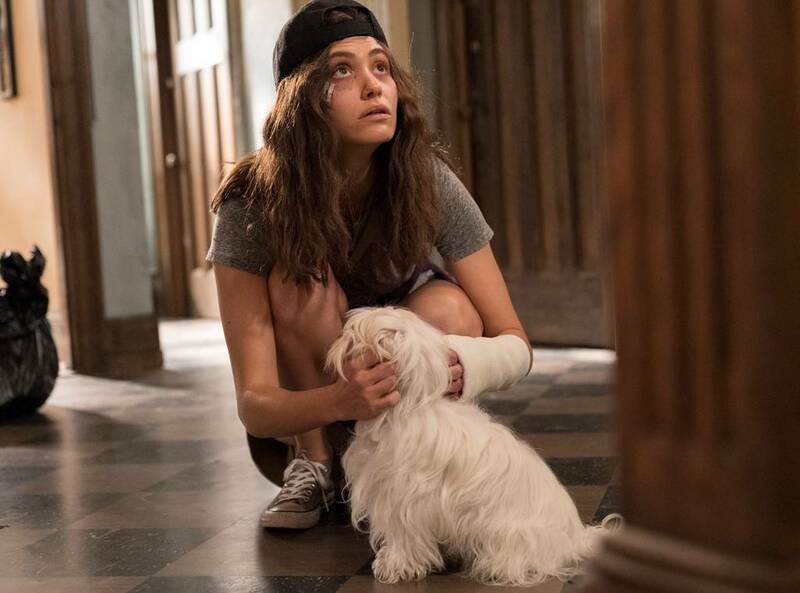 Following this news, Shameless was renewed for its eighth season beginning production in 2017. In August 2018, Rossum announced her departure from Shameless after nine seasons. A couple of NSFW grabs from Shameless. Linked at Pirate's Cove in the weekly Sorta Blogless Sunday Pinup and links. Wombat-socho has Rule Five Sunday: Post-Valentine’s Day Pinup and FMJRA 2.0: Holiday In The Sun up and running. Linked at The Right Way in this week's Rule 5 Saturday LinkOrama. Linked by EBL in Rio Carnival 2019, Nathalie Emmanuel, Chili Day, Polar Bear Day and I ❤ Pistachios.